The contamination of pet food with melamine and its analogue cyanuric acid led to kidney failure in thousands of dogs and cats in North America in 2007 drawing much flak. A year later in 2008, melamine again made headlines for wrong reasons, this time detected in powdered milk to make infant formula, the compound was associated with kidney disease in babies. Amid growing clamour from Western food and beverages brands for melamine-free packaging, Uflex Limited, India’s largest multinational flexible packaging materials and Solution Company at its Film Manufacturing Plant in Poland has developed Grade ‘F-AMF’; Melamine Free Acrylic Coated Bi-axially Oriented Polyethylene Terephthalate (BOPET) clear transparent film that is finding extensive use in conversion, printing, hot fill, retort, pasteurisation and sterilisation among other applications. The trials that were conducted at Flex Films Europa Sp. z.o.o. (Poland) have yielded excellent results in terms of nil melamine content, good printability and enhanced lamination bond. The film exhibits good transparency and clarity along with excellent machinability and handling properties. One side primer coating provides emphatic adhesion with inks and adhesives. The acrylic coated surface is also recommended for surface printing. The other side of film surface can be corona treated for value addition. The film possesses good mechanical, surface & thermal properties and ensuring excellent processability. This film has been specially developed for FFS machines. 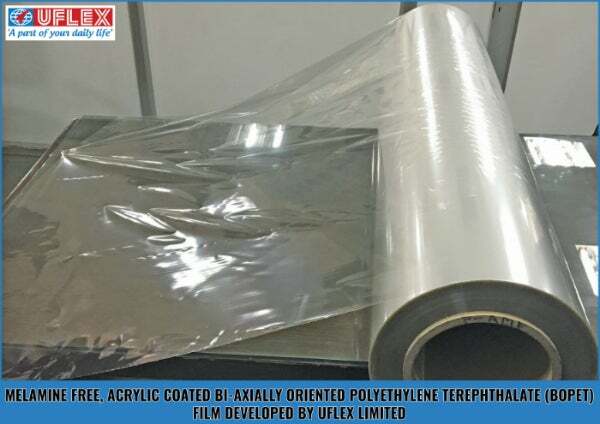 Upon successfully developing the Melamine Free Acrylic Coated Bi-axially Oriented Polyethylene Terephthalate (BOPET) film, Mr Pramod Sirsamkar, president technical and new product development (films) at Uflex Limited said: "Looking into the growing consciousness towards health, this Film has been particularly developed amid increasing demand from our customers globally." Mr Ashok Chaturvedi, chairman and managing director, Uflex Limited expressing joy on this development said: "Melamine-Free Acrylic Coated Bi-axially Oriented Polyethylene Terephthalate (BOPET) film is a testament to Uflex’s unwavering commitment towards consumer safety and customer satisfaction across the globe. Additionally this film also exhibits excellent transparency, gloss and printability making it an absolute delight for the converters. I congratulate my R&D team at this success."